All Night Nippon Super Mario Bros. (オールナイトニッポン スーパーマリオブラザーズ) is an officially licensed retool of Super Mario Bros., released in 1986 for the Family Computer Disk System. This version is based on the Japanese radio program All Night Nippon, and it was given out as a raffle prize on the show itself. 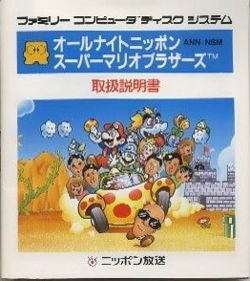 The game was published by Fuji Television, who would go on to publish Yume Kōjō: Doki Doki Panic, which was localized as Super Mario Bros. 2. Essentially, this game is a replica of the original, except with the sprites of the Toads and various enemies replaced with the likenesses of Japanese celebrities for a humorous effect, occasionally different levels, and the option to play as Luigi with his physics from Super Mario Bros.: The Lost Levels, although the 2-player mode is removed as a result. Some levels have been replaced by different ones. World 5-3 has been replaced by 4-3 from The Lost Levels, with some small edits, 5-4 has been replaced by 2-4 from The Lost Levels, 6-4 by 4-4 from The Lost Levels, 7-2 and 7-3 were replaced by 6-2 and 6-3 from The Lost Levels respectively. World 8-4 was changed into 8-4 from The Lost Levels. Additionally, after beating the game 8 times (doesn't matter if with warp zones or not), the player gains access to edited versions of Worlds A, B, C and D from The Lost Levels. World A-3 had its cloud platforms replaced with the mushroom platforms from World 4. This was because the clouds occupied the same graphic space as the mushrooms in The Lost Levels. World B-1 has been replaced by 5-1 from The Lost Levels (without the Warp Zone), B-3 with 3-3 from the same game. This means World B's setting has been changed into a snow world. World C-3 and C-4 were replaced by 7-3 and 7-4 from The Lost Levels. World D-1 was replaced by a modified version of 8-1 from The Lost Levels. This level has two different Goal Poles, both leading to D-2. Those worlds also feature Red variants of Tamori Piranha Plants, but only if they are upside down. Apart from that, all worlds feature minor edits, such as the appearance of more enemies in 4-1. Mario and Luigi gain more height from jumping on enemies, similar to The Lost Levels. Goombas and Piranha Plants were changed to big-headed caricatures of DJs Sunplaza Nakano and Tamori, respectively. Some Hammer Bros pursue Mario or Luigi like they do in The Lost Levels. Microphones replaced the mushrooms found in the background. The Fujisankei (the company that runs All Night Nippon) logo is found on the flag that is raised when Mario enters a fortress. The Fujisankei logo is also found as the axe that sits behind Bowser. The Mushroom Retainers were changed to Japanese celebrities, while Princess Peach gets a geisha outfit. As with VS. Super Mario Bros., the locations of ? Blocks and Brick Blocks were changed around, though the changes are different from Vs. The Starman was changed into a Hiranya, a symbol popularized by a Japanese radio show called Young Paradise. The Hiranya also resembles the Star of David, a symbol of Judaism. Most of the graphical changes from The Lost Levels were carried over, although bricks and mountains are drawn like the first game instead. Bricks are not shaded, and mountains have smooth slopes instead of jagged slopes. Mario and Luigi, when stopping after running, make the same skidding noise as in The Lost Levels and later, in Super Mario Bros. 3. World 1 was changed to night time. Windstorms were removed, affecting the difficulty of the courses they were found in (most noticeably World B-1). World 4-4 and World 7-4 have their maze solutions revised. World 8-4 is the only course unmodified from the Japanese Super Mario Bros. 2, unlike the original Super Mario Bros. The Starman from the game. The Mushroom-type Platforms in World 1-2 as also seen in The Lost Levels. Mario jumping to a platform in World 1-3. The axe from the game. The head by the pipe is Sunplaza Nakano, while the head in the pipe is Tamori, both respective replacements of Goomba and Piranha Plant. The end of a level. Mario's small form in the game. Goro Itoi is unlisted in the game's instruction manual, likely to make his appearance in the game a surprise tribute to him, as he was one of the original DJs of All Night Nippon. Other games with a similar concept of Mario meeting Japanese celebrities were found on the Satellaview, with spiritual successors such as BS Super Mario USA, BS Super Mario Collection, and a version of Wario's Woods. Kaettekita Mario Bros. was another similar project. Luigi is shown to look exactly like Mario with a blue hat and overalls and a green shirt on the cover of this game. This game marks the first time Princess Peach has ever done her hair up, predating Super Mario Sunshine by 16 years. This page was last edited on December 8, 2018, at 18:52.